How to spot a fake Kate Spade purse | iSpotFake. Do you? There are two basic types of labels: embossed and fabric. Embossed and stamped labels are simple. They will appear on leather bags, and leather bags will never have a fabric label on them. They generally appear on the front top of a purse and the lettering appears in the same font and size as the fabric labels. Fabric labels get a bit more complicated. The best way to identify the fakes from the real thing, though, is through the method of attachment and the lettering. All Kate Spade bag fabric labels are attached through stitching. That means they are actually stitched onto the bag, not that the label has stitching on it. Many counterfeiters put a fake stitching around the label on then glue it on. Pull on it and if it pulls up, it’s a fake. Bags have specific lettering on the labels. This means that the name “Kate Spade” appears as “kate spade,” with even spacing and clean lines. The labels will say “New York” in all uppercase under her name, or her name will appear alone. There are other very specific labels for Kate Spade, but they are for individual collections. If you are unsure about a label, confirm it with the Kate Spade website. Go to the Kate Spade website to view authentic labels and compare the font on the suspected fake. If the letters vary in any way, your suspicions are justified. Kate Spade only uses one style of lettering on all of her purses. Be suspicious of color block purses, bags with two small front pockets and backpacks. While Kate Spade did design bags like these, they were all produced over a decade ago and are hard to find. Most often, bags with these attributes are fakes. Look out for large metal feet on the bottom of Kate Spade purses. Big, pointy metal studs or ones wider than the size of a dime are signs that you’re not looking at a real Kate Spade purse. For bags that come with feet (not all do), the feet are small and unobtrusive. They aren’t pyramid or cone shaped. If you have a bag with large feet on it, chances are you have a fake. Question any Kate Spade purse that looks like another designer’s work. Purses that seem similar to ones made by Dior, Burberry, Coach and other high end designers yet have a Kate Spade label are definite fakes. Kate Spade has a very distinct style and never copies her competitor’s lines. Rule out purses with a single large black stripe on top, sunflower prints, toile, camouflage, tie-dye or prints with the faces of celebrities. 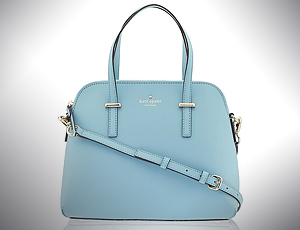 These are very popular fakes-and not at all similar to any authentic Kate Spade designs. Examine the zipper and snaps. If they look to be of poor quality or show any signs of tarnish or rust, the bag is a fake. Examine the shape of the purses available and what collection they claim to be from. Many counterfeiters will get the print right, but then produce their bags with a shape from a different collection. Check out Kate Spade’s line to make sure your bag fits both the shape and print. Look for an authenticator. There is one commonly referenced online, called “I Hate Counterfeit Bags Info.” Check your bag against the website creator’s specifications or contact her to authenticate your bag.